The PCB is soldered, we did the metal work and the paint job on the project box. Now we are going to assemble it further and finish the Automatic Magnetic Loop Tuner. 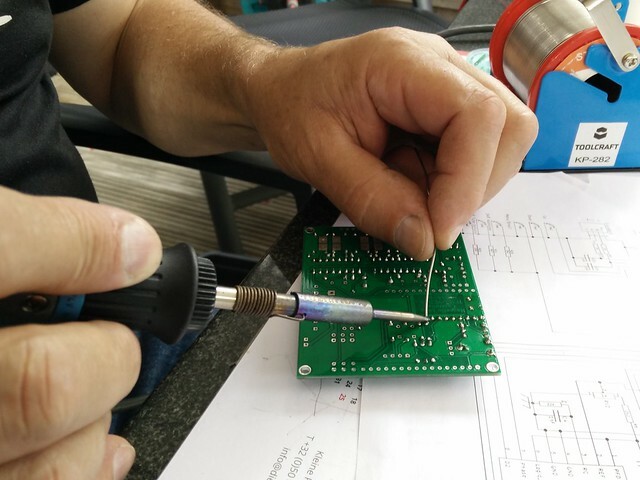 The only thing we need to do before we put the switches, screen and connectors in the project box and connect them to the PCB, is to solder the connection wires. For these wires I used Dupont wires, with female connectors of 2, 3, 4 or two times 6 pins. The one with two times 6 pins does not really exist, you have to make it yourself. For this I took a rainbow color multi cable Dupont wire. 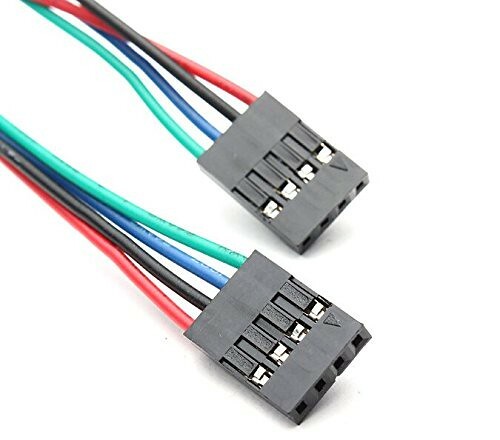 Removed the single female connectors and replaced them with 6 pin Dupont connectors. Use some shrink tube to make sure all connections are well insulated and will not cause a short circuit. 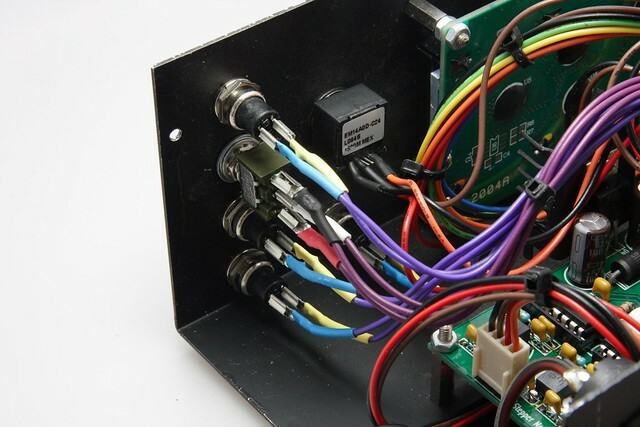 When done, it’s only a matter of connecting the right switch to the right header on the PCB. Check the electrical diagram to know the function of each switch. 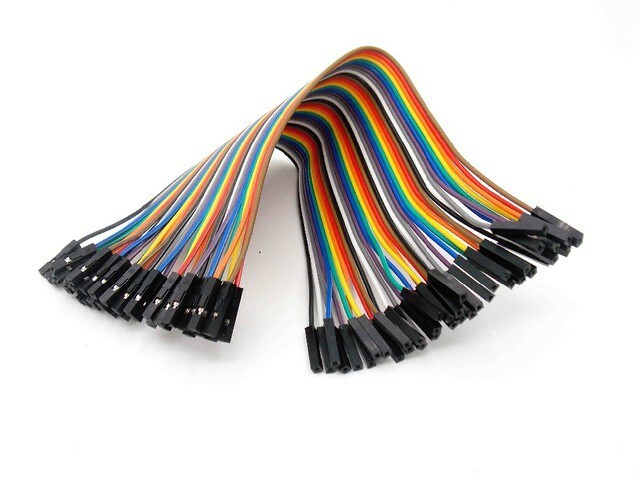 When everything is connected, you might want to tie together some wires to tidy things up. Your project will certainly look better and not like a rats nest of wires. 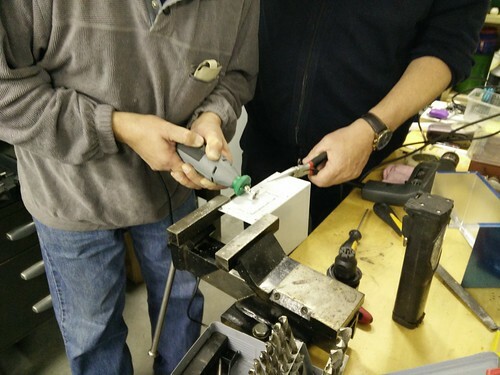 Put the lid on the box, fasten the screws and your Automatic Magnetic Loop Tuner is ready to be used. Now it’s time to put the soldering iron down for a while and pick up our metal working tools. Our little project needs a box to live in. Although not a real beauty, we used the same project box Loftur is using. The Hammond 1411QU. If you have some extra cash to spend you can go and find much more professional looking boxes, laser cut and engraved. When doing this project with your club (and thus in need of several boxes), I strongly recommend considering this option. 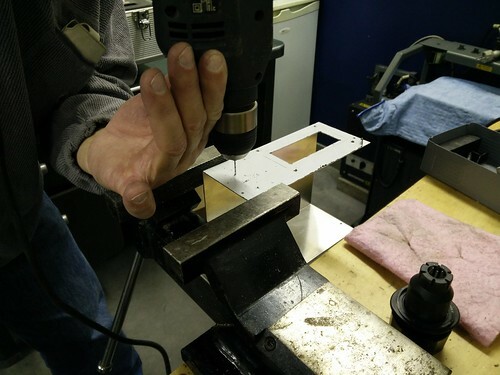 Hand Drilling, cutting and filing the project box is feasible if you only need to do it once. Making 10 of these boxes by hand can be another of your hobbies, but not mine. When ordering custom made boxes in quantities above 10, you can still get them at a reasonable price. 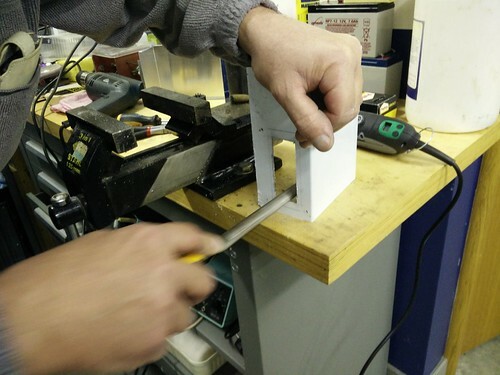 In our case, we did the drilling, cutting and filing with a simple drill, a dremel alike multi tool and an ordinary file. We didn’t mind the scratches as we would paint it afterwards anyway. 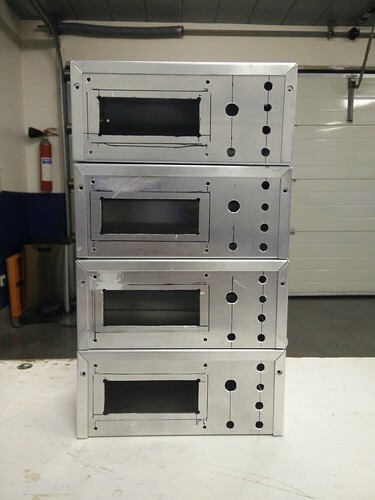 Another advantage of custom made, laser cut and powder coated, or ionized painted cases is that the paint job will not easily come off. Using spray paint is not an issue if you put the Automatic Magnetic Loop Controller in your shack and keep it there. I took mine already on several trips, showing it off at other ham radio clubs while presenting this magnificent project. Not that I don’t like it anymore, or that it would not perform as before, but it got its battle marks. 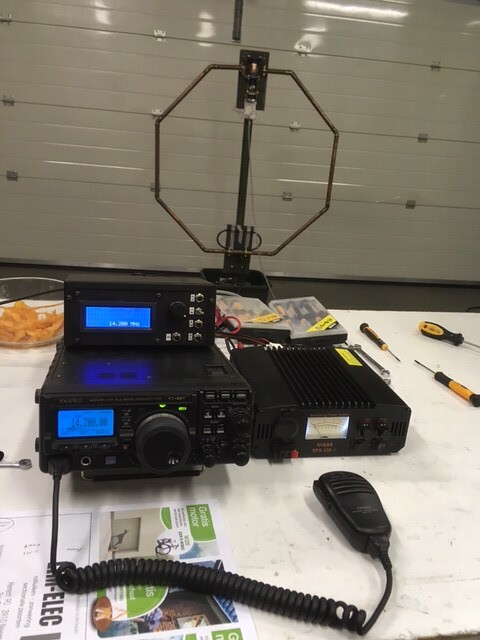 Since we are dealing with RF we have to keep it away from all other components and equipment in our shack. The only thing you want to generate or pick-up RF with is your antenna. In our case a magnetic loop antenna. 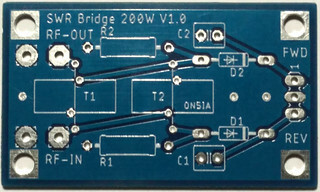 The purpose of the SWR Bridge, or tandem match, is to measure the difference between the forwarded and reflected power. To do that, we have to place the SWR Bridge between our antenna and our transceiver. Idealy this should be done as close as possible to the antenna. This however, is not very practical, as you won’t be able to read the values on the screen. 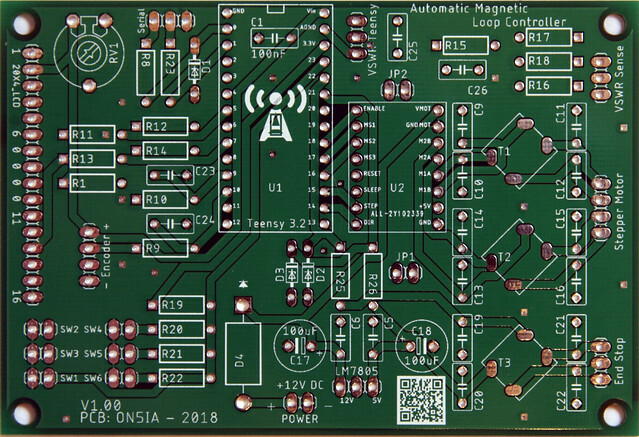 That’s why its placed inside the automatic magnetic loop controller unit and also why we need to create a shield that will keep the RF inside the SWR Bridge box. To be able to measure the differences between forward and reflected power, we need to connect the SWR Bridge to the Teensy, pad A10 and A11. If we would just drill two holes in the tinned box and wired the SWR Bridge directly to the Teensy, the RF could still escape and cause trouble in our tuner or even in the shack. 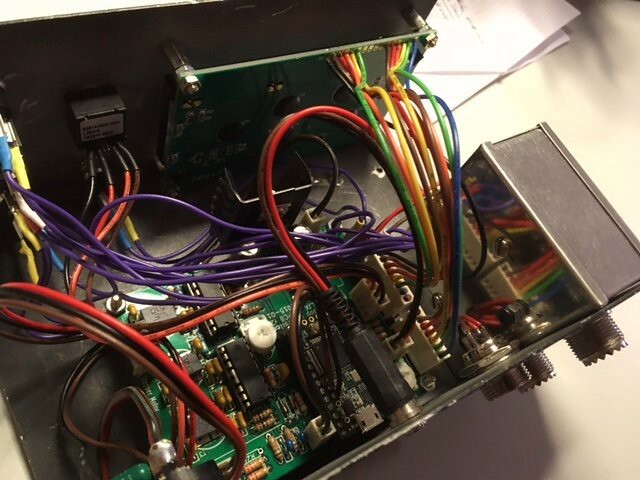 By using feed through capacitors, we can connect the SWR Bridge to the Teense and measure both forward and reflected power, while still keeping the RF in the shielded box. 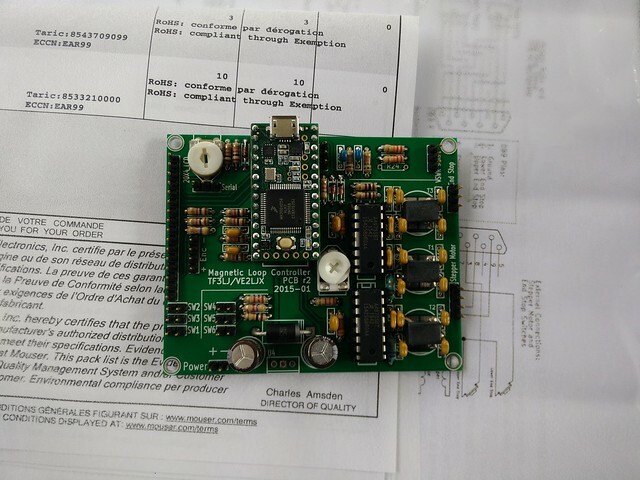 Let’s zoom in on the electric diagrams, the source code and the PCB design to know how the SWR Bridge must be connected to the Automatic Magnetic Loop Controller PCB’s. This implies both Loftur as mine PCB designs. Looking at the SWR Bridge, or Sontheimer Bridge, it’s fairly easy to understand. 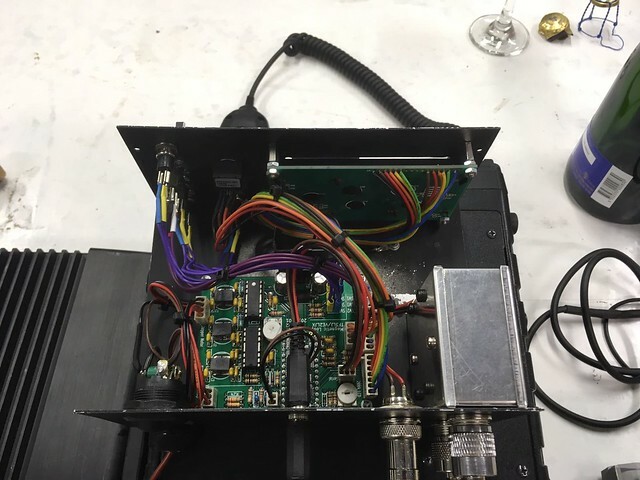 Connect your transceiver to RF In, connect the antenna to RF Out. On the other side of the board we have FWD (pin 1), GND (pin 2) and REF (pin 3). This is the part where we need to keep attention. On the PCB the pinout position is different for GND and REF. Connect SWR Bridge pin 1 (FWD) with pin 1 on the PCB, SWR Bridge pin 2 (GND) with pin 3 on the PCB and SWR Bridge pin 3 (REF) with pin 2 on the PCB. After our signals went through some resistors and capacitors, they can be connected via another 3 pin header to the Teensy 3.2 pads A10 and A11. Pin 1 (FWD) is connected to Teensy pad A10, and pin 2 (REF) to Teensy pad A11. While reading the frequency from the radio, and having the “antenna characteristics” in the tuner’s memory, there is no real need for a SWR bridge to be used. However, we can add a basic power/SWR-meter and auto-tune function if we do so. For this SWR bridge, Loftur proposed to use a Tandem Match over a Bruene Bridge. 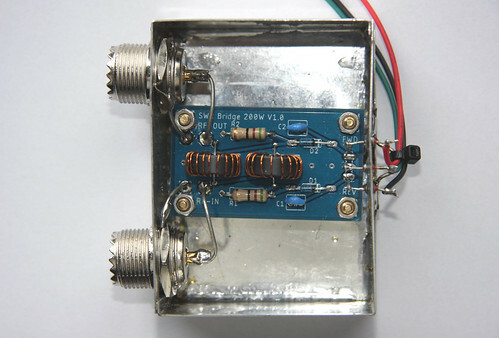 at 100W), should be able to handle 200W SSB without upgrading the resistors to 1/2W type. the outputs. This is necessary for fast SWR tuning. C3 and C4 are omitted. Note the different order of the pins at the J1 connec tor, when compared with the VSWR sense connector on the Controller PCB. 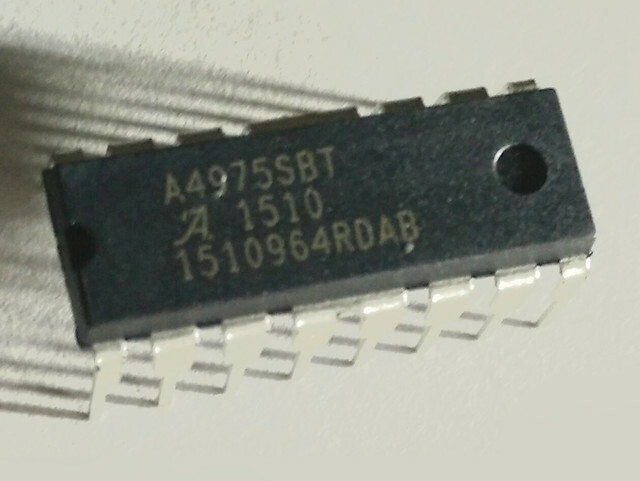 R17, R18 should be 22 kohm 1/4W (example: Digikey 22KQBK-ND). Due to the number of components that needed to be replaced or tossed away, and since there was some interest from other OM’s of our club, I designed a SWR Bridge kit with the correct components and sufficient copper wire for the 20 turns per toroid. Since the calibration resistors are omitted from this design, it’s important to make the toroids as equal as possible. A small deviation is not an issue. The tuner will tune to the lowest SWR point. Even if the reading is a bit off, the antenna will still be tuned to the minimum SWR. 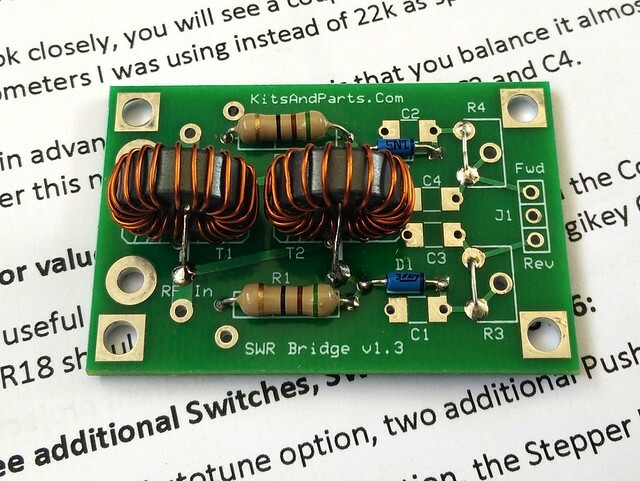 Drop me an email at on5ia@uba.be if you are interested in this SWR kit especially made for the Automatic Magnetic Loop Tuner. When all components were delivered, it was time to put them all together. The effort I spent writing custom references for all components, at the time of ordering, was well worth it. 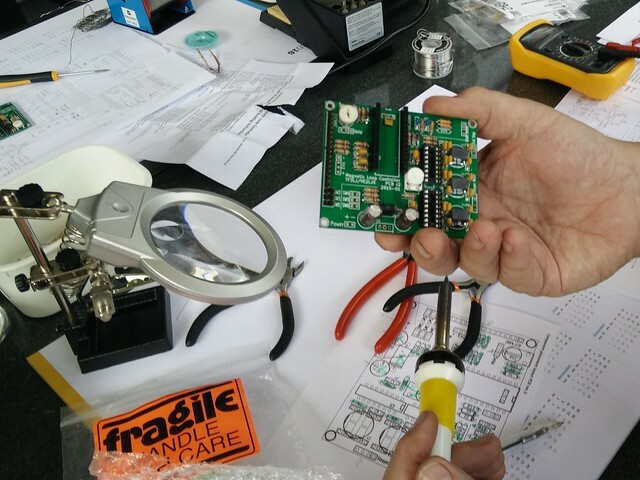 Now each bag of components like resistors, capacitors and trimpotmeters was labeled with the correct reference name for the project (R1, R2, C1, U1, etc..). 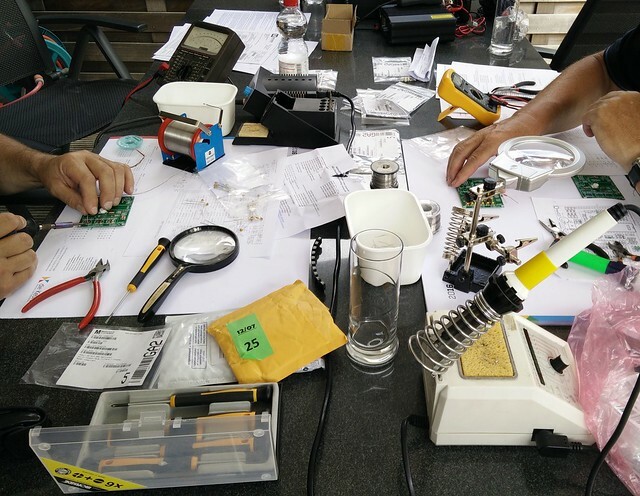 My two friends were armed with a soldering iron, and I was providing them the ammunition in the form of electronic components. Here we are soldering the 14 pin female headers for the Teensy 3.2. Check twice, solder once. 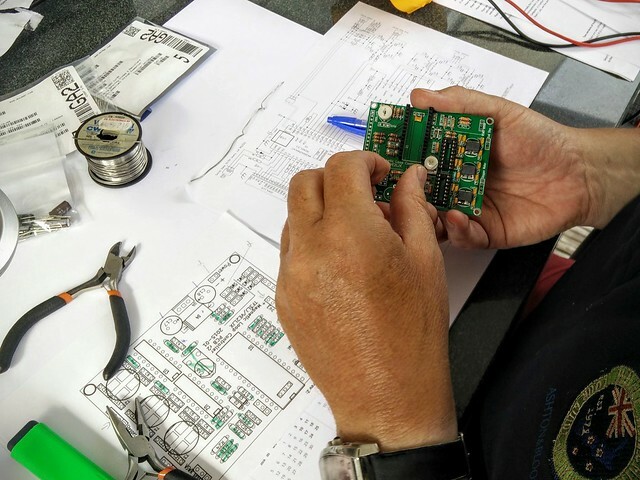 Each component that was soldered to the PCB was checked. We had to be sure all values were correct and within the tolerance. It might seem like a bit of overkill, but faulty components do exist. 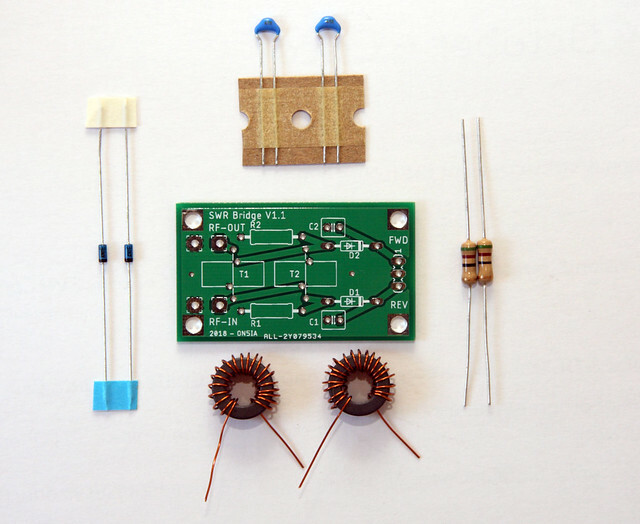 One project almost failed because of a faulty resistor. If we didn’t check it upfront, we would have lost a lot of time debugging our project. The finished product of the day. We made 3 of these PCB’s in 4 hours time. That’s definitely not a speed record, but when you are having fun with friends, who cares about the time.